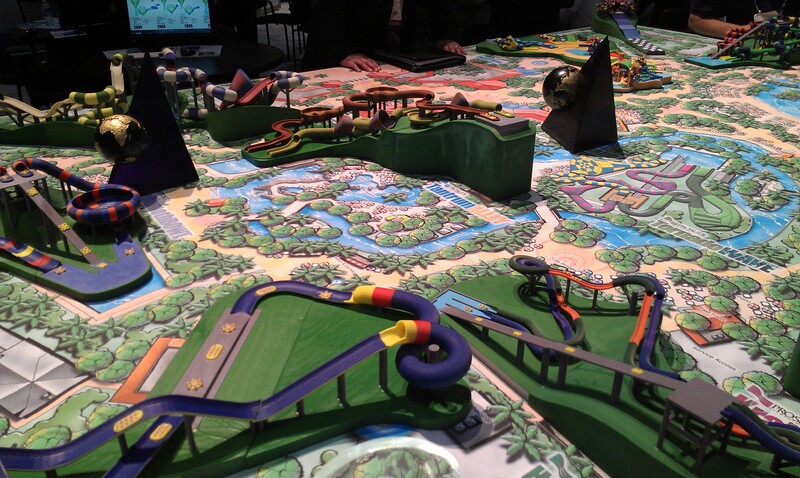 Part 1 of the 2013 IAAPA Attraction Expo recap. IAAPA Attractions Expo 2014 is coming soon and will again be hosted at the Orange County Convention Center in Orlando, FL. Like in 2013, the indoor show floor is sold out and I am expecting another fantastic year of discoveries and a glimpse at what the industry hold for the future. 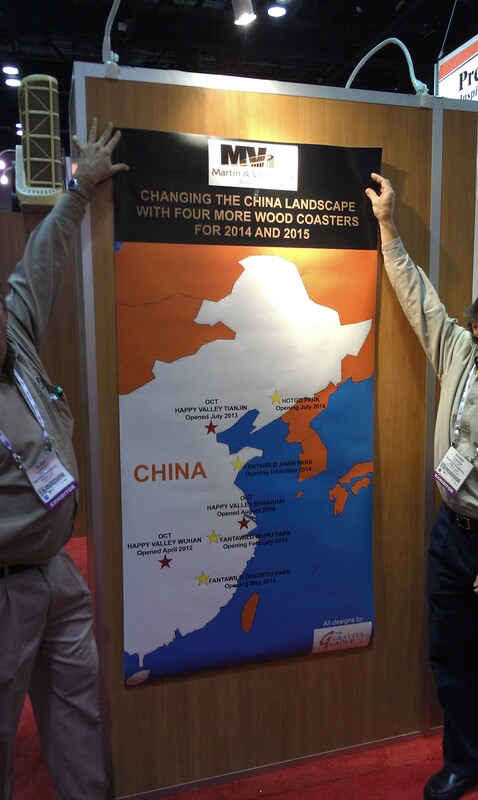 So, I will recap the major announcements and notable exhibitors of the 2013 Attractions Expo. First, the water park industry and its contributors are currently in a golden age. 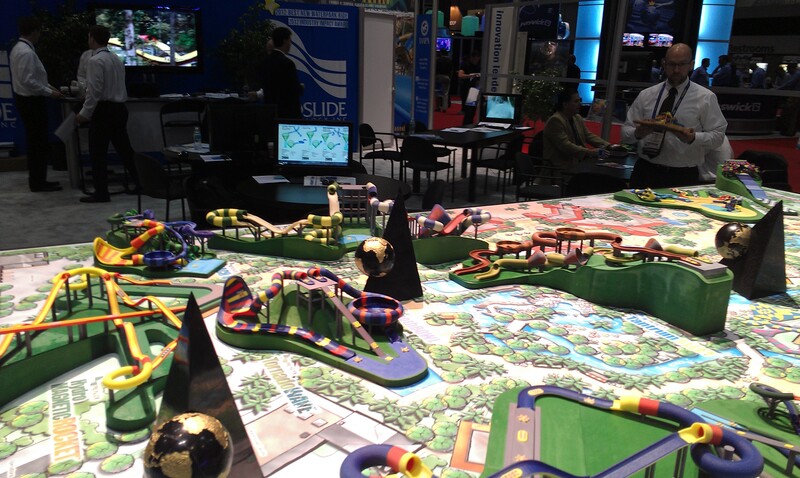 Even though they have their own association (World Waterpark Association) and their own trade show, most are still present in Orlando and are members of IAAPA. The largest water slide suppliers currently are Proslide Inc. from Ottawa, ON, Whitewater West Inc. from Richmond,BC and Polin from Kocaeli, Turkey. Other companies such as Splashtacular from La Quinta, CA and Aquakita from Escobedo, Mexico also exhibited their creations. Proslide had one of the largest booth with their amazing and unique scale models of their slides. Set on a large table, they are used effectively to demonstrate to potential clients how a Tornado or a Rocket slide would fit inside their park. A large display displayed the 65 awards that the company won in their 29 years history. 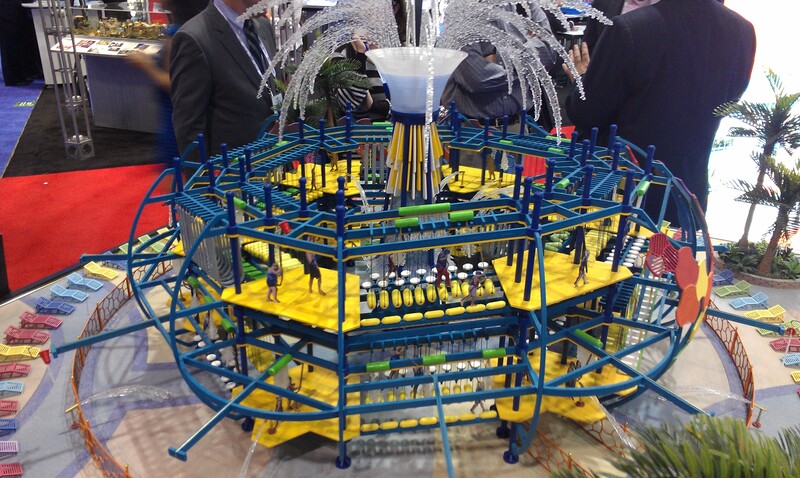 They added one at the show, winning the IAAPA Brass Ring Award for the Best New Waterslide for the Hybrid ride that opened at Yas Waterpark in the UAE. Combining the award winning Proslide Hydromagnetic Mammoth with a spectacular 60 feet Tornado funnel, it is possibly the greatest water slide ever created. 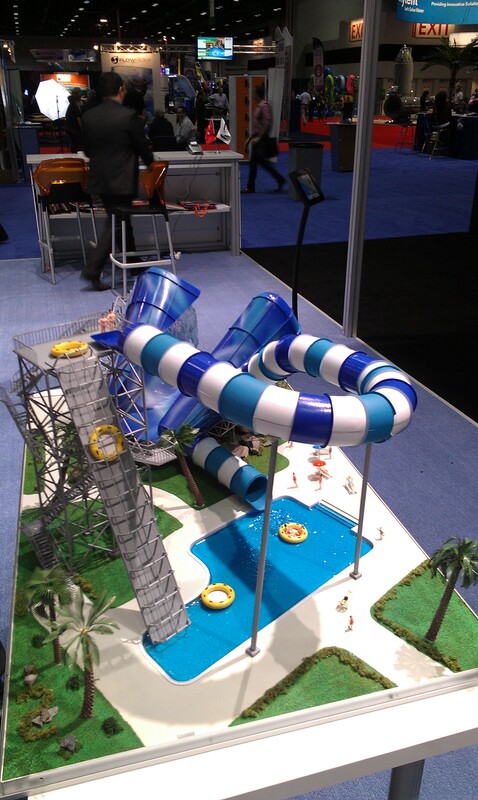 Those pictures show the custom scale models that Proslide use to show potential customers the possibilities. 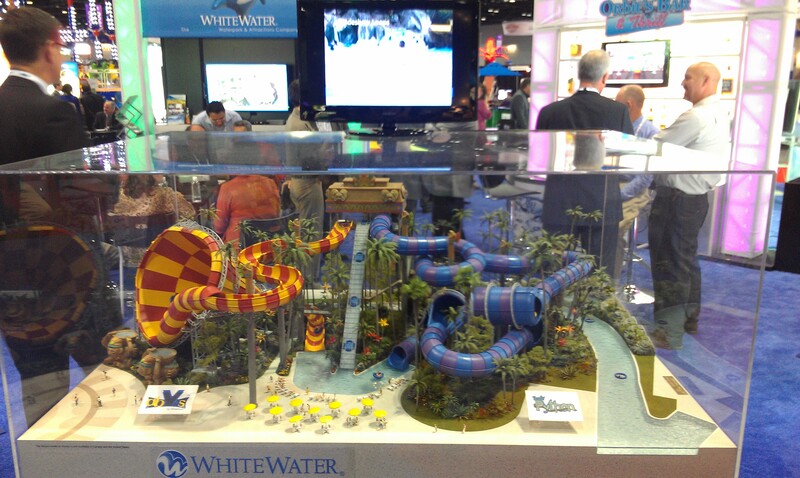 Whitewater West has been in business since 1980 and market itself as the Original Waterpark and Attractions Company. 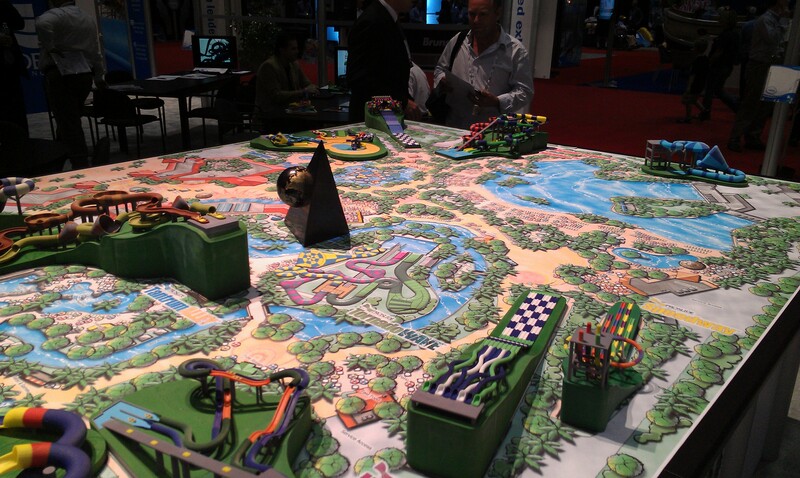 Their large booth showcased the 4 aspects of the company today: waterpark attractions, Prime Play, Hopkins Rides and Apptivations, a brand new division. They offered a demo to the press of their new innovations. For Prime Play, a brand new rope course that used an innovative round safety rail and silent metal loops that avoided a major inconvenience of rope courses: excessive noise. An interactive mat racer water slide was the next innovation. The last was an interactive application that works with the guest smartphones. Once that application is activated, the phone turn into the key that turn what appear to be normal scenery into an interactive scavenger hunt. Whitewater West also had a few large scale models on display, such as the Abyss, the world’s largest funnel and the new Prime Play water rope course. 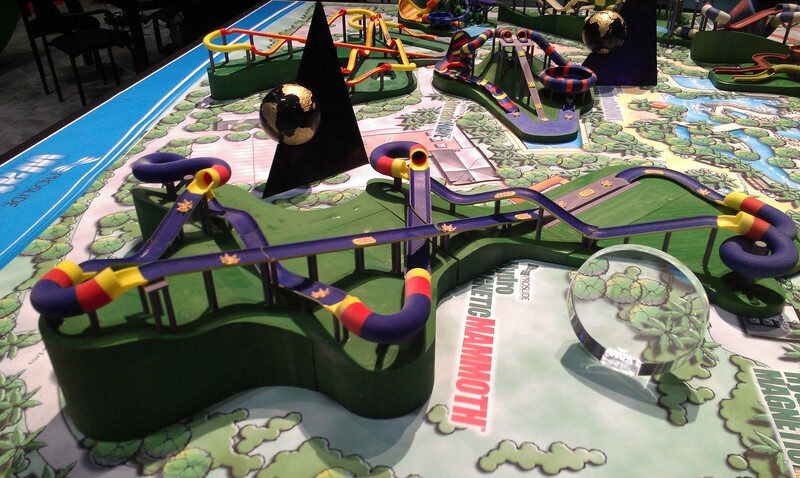 Models of the Abyss that was installed at Sunway Lagoon (Petaling Jaya, Malaysia) and the Family Python tube slide. Polin had a booth near the back of the show floor and had a few models on display as well. Their unique custom theming that can mold any slide from plain fiberglass to a menacing cobra were on display as well. 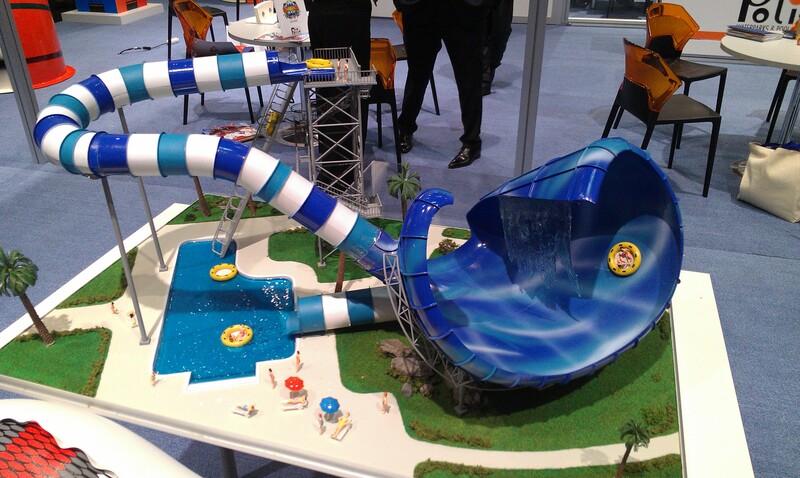 The Surf Safari, a new funnel slide. In addition to the water attractions manufacturers, everything that is needed for a successful park is present. Need 1000 tubes for your park? Leader Sports, Zebec and Zpro Sports among others will provide competitive price and have all kind of devices on display. 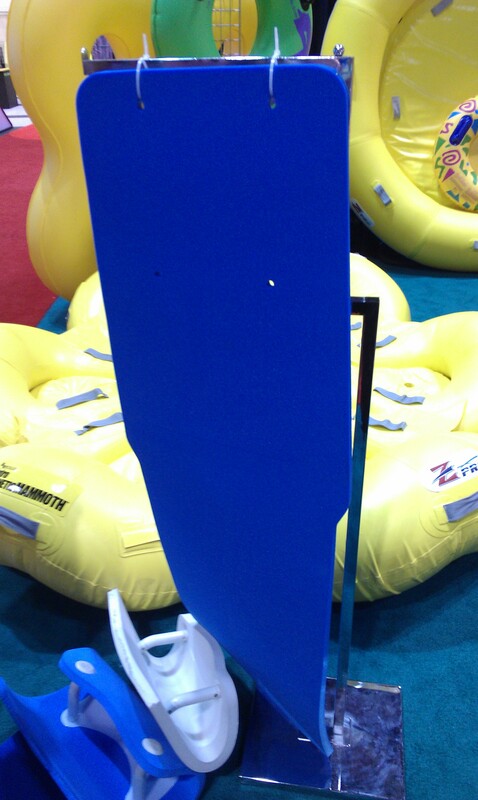 Zpro Sports is Proslide exclusive supplier for the patented WhirlyWHEEL and Cloverleaf Rafts used on many of their slides. Zebec supply Polin with the prettiest tubes in the market: the snake skin rafts used on the King Cobra half Pipe attraction. A few conveyor belts and lifts for water slide towers manufacturers are also present. 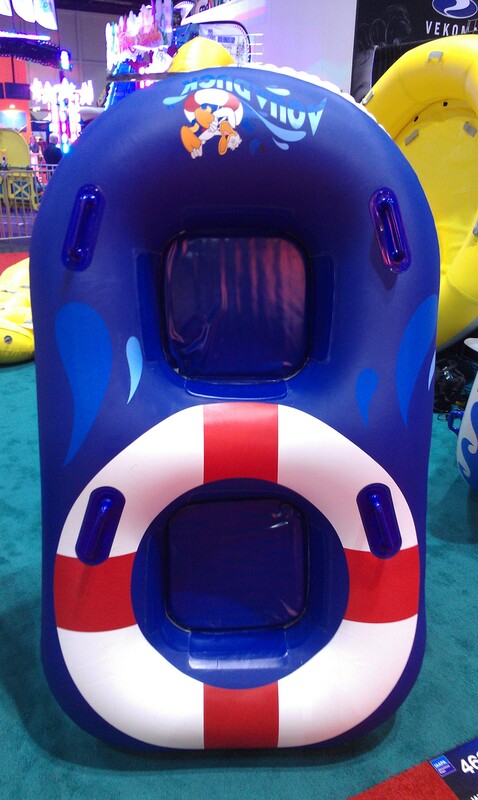 Zebec manufacture the custom rafts for the Disney Cruise Line Aqua Duck. Aqua Duck is a Whitewater West Master Blaster built around the top deck of the Disney Dream and Disney Fantasy. Mats used for various mat racing slides. 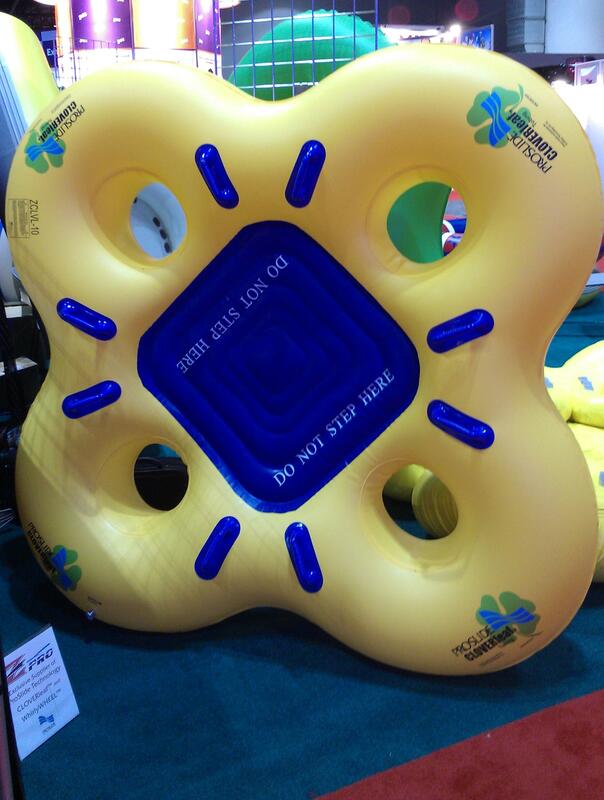 The patented Proslide CloverLEAF raft. 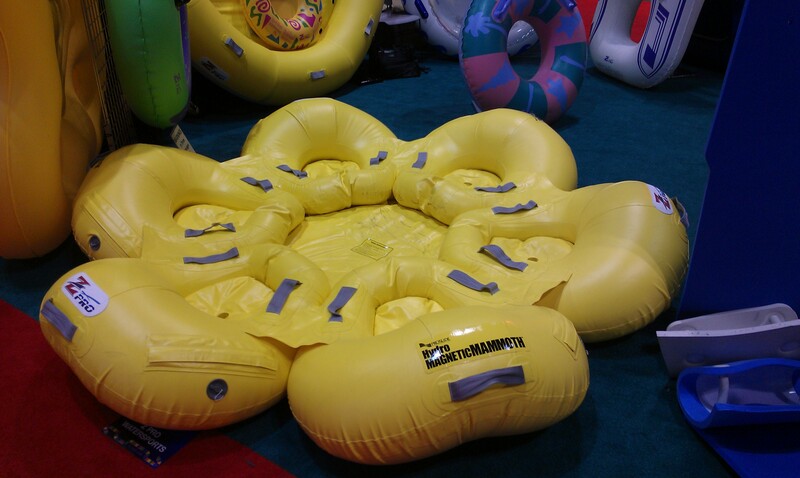 The Hydromagnetic Mammoth rafts. Those are extremely heavy and are equipped with metal plates on the bottom. In order to extend the life of those expensive vehicles, they are mounted on a easily replaceable skirt when in operation. 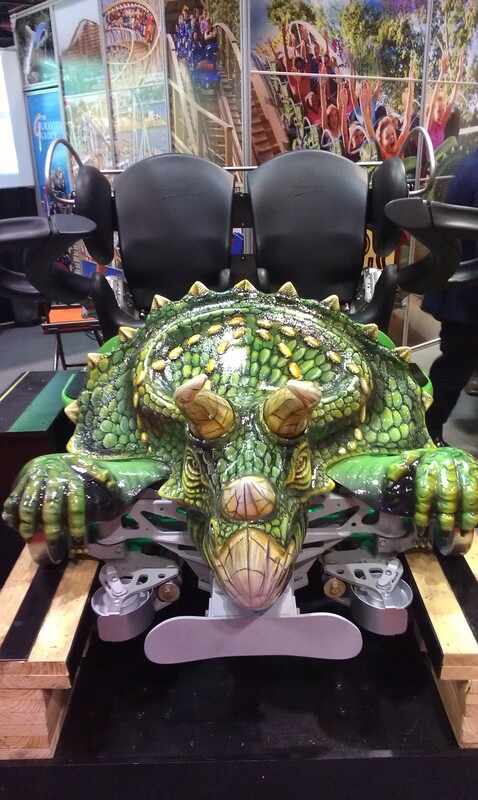 Roller Coaster manufacturers are always the headliners at the show and this year was no exception. Premier Rides had a large booth in front of the right entrance and while no ride cars were on display this year, the large team had set up a comfortable space for their customers. Bolliger & Mabillard were further on the same aisle and had a car from the new “Flying Over Rainforest” Wing Coaster on display. 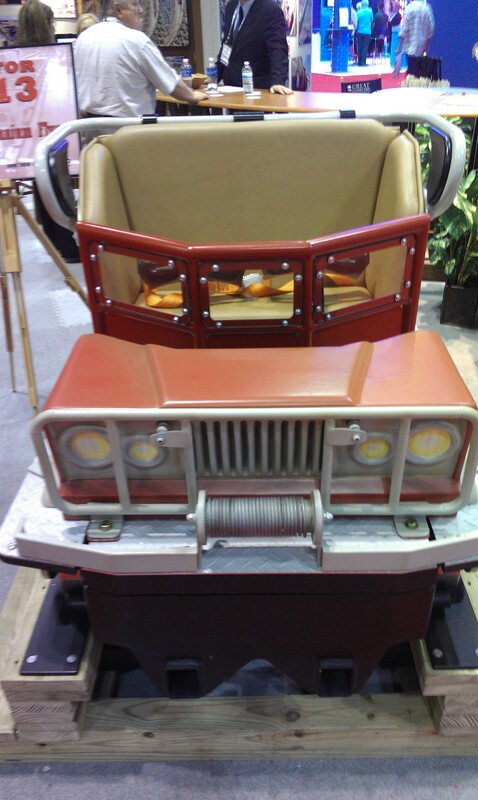 During the first day, there was a surprise announcement from Great Coaster International Inc. GCII unveiled the “Mini-Lennium Flyers” ride cars that were designed to fit the narrow gauge of the traditional junior wooden coaster. This particular car was a copy of the one coming to the Coastersaurus at Legoland Florida. Located nearby in Winter Haven, FL, potential customers were easily able to visit the park as the train opened to the public on the 3rd day of the expo. Front car of the Coastersaurus. The “Viper” was announced. Opening in 2015 at the re-imagined Wanda City Theme Park in Xinjian, China, this will be the main attraction at this park that is currently undergoing a yearlong makeover. 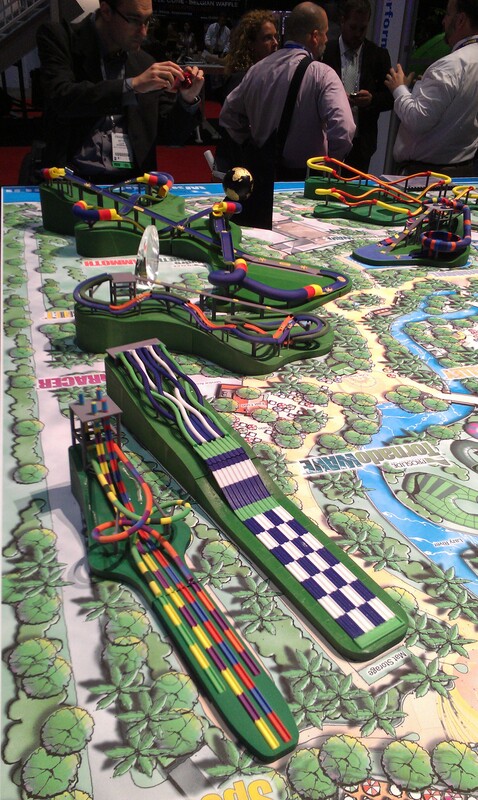 It will be the largest roller coaster ever designed by GCII with 5111 feet of track and a 160 feet tall lift hill. It will run stand Millennium Flyers trains. 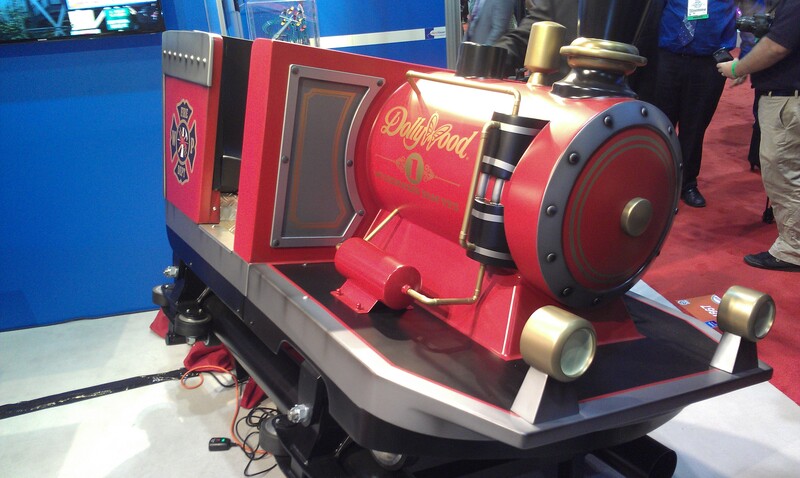 Gerstlauer and Dollywood (Pigeon Forge, TN) unveiled the front car of “Firechaser Express”. This new generation mine train feature a traditional chain lift hill and two launches. The ride features two transfer tracks as well. The park included a special effect show featuring fire and water to the exploding firework factory in the middle of the ride. 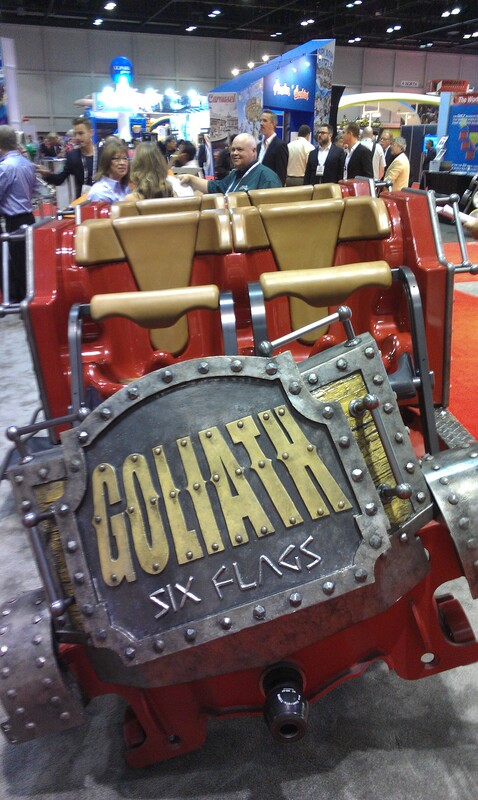 Rocky Mountain Constructions (RMC) and Six Flags unveiled the front car of the Goliath that opened in 2014 at Six Flags Great America (Gurnee, IL). Breaking multiple world records for wooden roller coasters, it run two 6 cars trains similar to the ones that premiered on Outlaw Run at Silver Dollar City (Branson, MO). The main difference beside the custom front is that after listening to concerns from riders, RMC redesigned the shin bars. The Outlaw Run shin bars were foam covered steel bars and for some riders, made it very uncomfortable. So, the redesigned shin bars now have a pre cut shape in them. This is to allow passengers with longer legs to comfortably fit on the ride. Front car of the Goliath at Six Flags Great America. 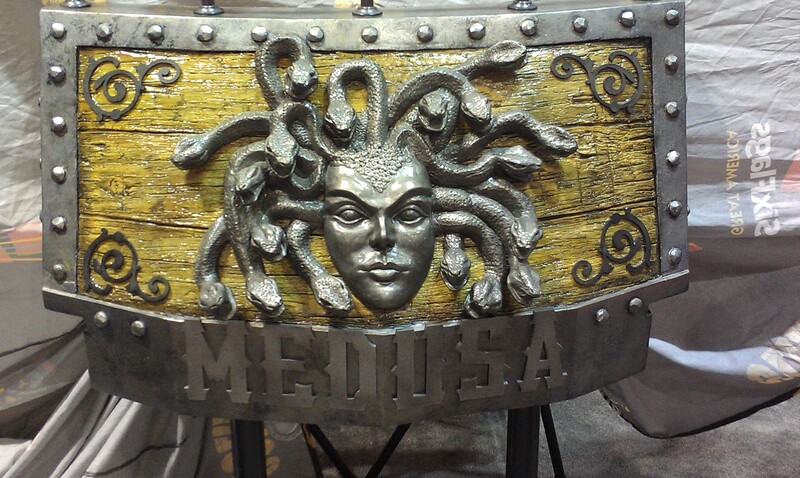 The front piece of the Medusa Steel Coaster at Six Flags Mexico (Mexico City). 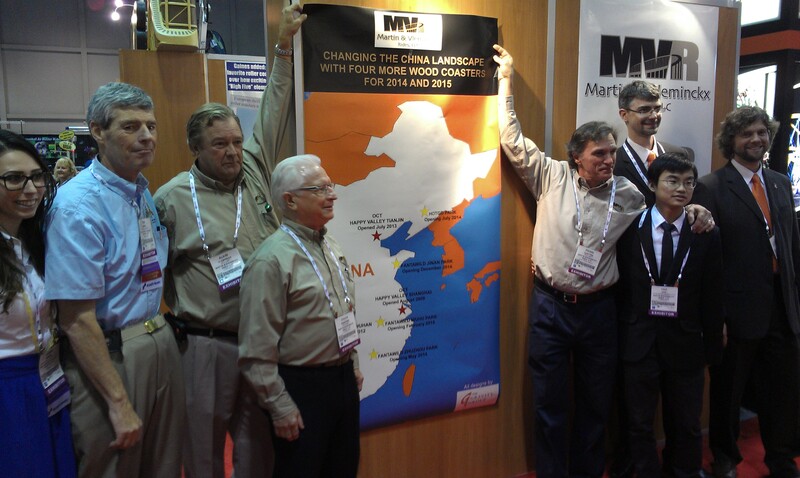 Martin & Vleminckx announced 4 new wooden coaster projects for China in 2014/2015. Design and engineering is realised by the Gravity Group, the braking system is from Velocity Magnetics. The trains are either PTC articulated cars or The Gravity Group Timberliner, based on the customer’s request. The first to open was the Wooden Roller Coaster at Hot Go Park. Located in Fushun, Liaoning, this park opened in September 2014 and the new wooden attraction is the headliner of the park. With nearly 4000 feet of track and built on very hilly terrain, this ride run two Timberliner trains from The Gravity Group. The other installations will go to three new Fanta Wild theme parks in Shifang, Wuhan and Jinan. Map showing the new projects. The whole team in front of the poster. In addition to the new project announcement, M&V also announced that they were going to have a presence in Istanbul, Turkey to promote new projects in the region. They forecast it as being a booming region for mechanical rides in the future and thus, they wish to get a head start in the area. For the Chinese market, Yao Yao, also known as Owen was promoted to the post of Chinese representative. The Gravity Group also had an announcement of their own, with the family park known as Story Land presenting a new wooden coaster. Located in Glen, NH in the White Mountains, this beautiful park was celebrating their 60th anniversary and decided to add a feature attraction. Themed after dinosaurs, this family roller coaster has a 40 feet tall lift hill, 1232 feet of track in a very compact layout and 12 airtime moments. What is a funny touch is that the front car of the Timberliner train will feature a Triceratop dinosaur head. That same front car was actually shown as a mold last year during the show as a possible theming possibility and for once, a customer purchased it! 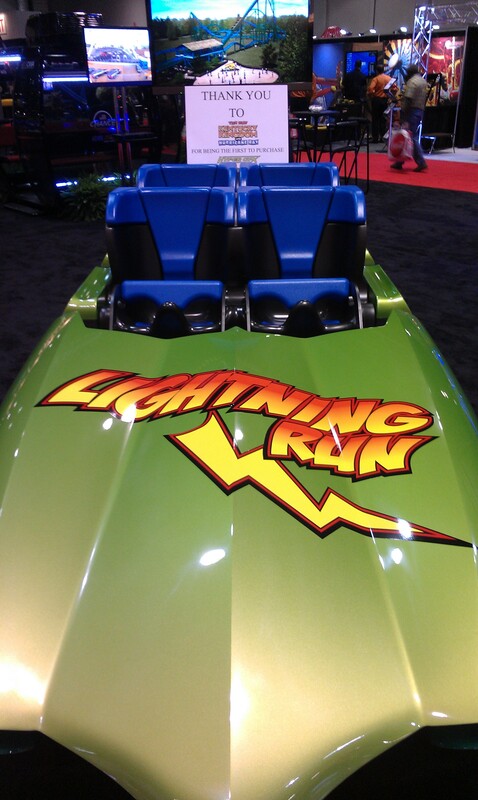 Chance Rides had a Ferris wheel car and one of the car for the new Lightning Run. Lightning Run is the prototype Hyper GT-X roller coaster and opened in 2013 to a resounding success. Featuring a 100 feet tall lift hill in a very compact layout, the ride cars were designed by Alan Schilke Centerline Technology company. He also designed the RMC Gen One car and thus, both feature the same class 5 lap restraints. Rides-4-U was one the greatest success story on the show floor. 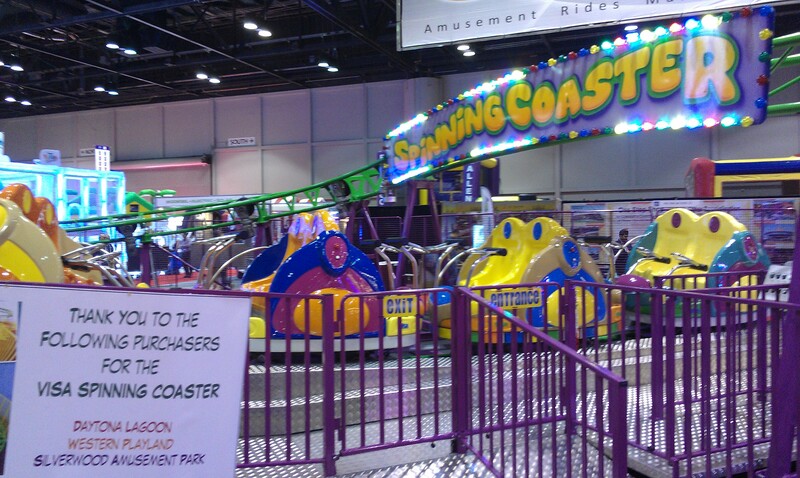 They booked a large booth and to every attendee surprise, a roller coaster was operating on the show floor! They imported from SBF Visa a brand new compact spinning coaster that ran a high capacity 4 cars 16 passengers train in a figure 8 layout. 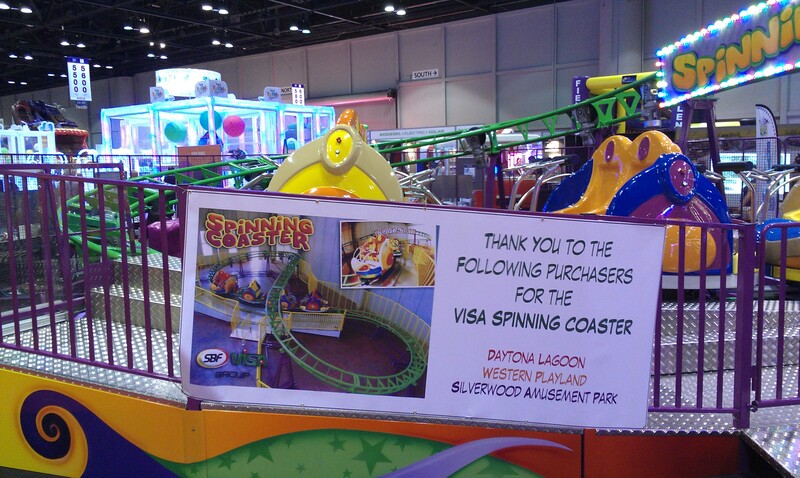 The ride was a complete success and three were sold right there on the show floor, including the model on display to Daytona Lagoon, located an hour away in Daytona Beach, FL. Rides-4-U also brought a spinning family tower attraction. S&S Sansei had a car from the new Adventuredome (Las Vegas, NV) El Loco attraction. Featuring the company new overhead lap bar, it also has a sound system and speakers installed on board. This entry was posted in IAAPA and tagged Abyss, amusement park, Chance rides, China, Coasters, disney cruise line, Dollywood, Firechaser Express, goliath, kentucky kingdom, Medusa, polin, proslide, raft, Rides, six flags, six flags great america, Six Flags Mexico, water slide, whitewater west. Bookmark the permalink.